CHOLENEC, PIERRE, priest, Jesuit, missionary; b. 10 June 1641 at Saint-Pol-de-Léon in Lower Brittany; d. 30 Oct. 1723 at Quebec. Father Cholenec entered the Jesuit order in Paris on 8 Sept. 1659. Having an easy-going mind and amiable disposition, he did not make one think of his native land, “where the laws of salvage encouraged wreckers.” While he was still doing his philosophical studies he was appointed prefect to Prince Rinaldo d’Este. After completing his theology at the Collège Louis-le-Grand in Paris, he set out for Canada in 1674. The following year he was at Kentaké (La Prairie de la Magdeleine), where he distinguished himself as a preacher and spiritual director. There he met Jacques Largillier, dit Le Castor, and Pierre Porteret, two donnés who had assisted Father Jacques Marquette* in his last hours. The detailed account which he immediately prepared was the first of several relations of this death. In the autumn of 1677, at the Saint-François-Xavier mission to the Iroquois, he welcomed Kateri Tekakwitha*, who had just come from the Mohawk canton. As did his confrères in the mission, and as he did also with all those under his direction, he sought to christianize her rather than frenchify her. More than once this missionary point of view aroused Governor Buade* de Frontenac’s anger. From 1683 to 1688 Father Cholenec worked at Lorette, but he then returned to the Iroquois mission, of which he was the superior from 1695 to 1699. At that time he wrote a biography of Kateri Tekakwitha, in a natural, correct style. In 1700 he was the superior of the Jesuits in Montreal but he afterwards returned to Saint-François-Xavier, where he held the office of superior from 1712 to 1722. 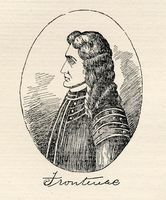 He composed another life of Kateri Tekakwitha, intended for the Lettres édifiantes, and, in Latin, a letter and a biography of the Iroquois virgin destined for the general of the Jesuits in Rome. This last letter was followed by an account of the martyrdom of several Indians of his mission which was insufficiently known. Shortly before his death, Cholenec enjoyed the happiness of living in the new Jesuit residence, which had been built by his efforts at the very centre of the new mission site, and which is still inhabited by this order today. He died on 30 Oct. 1723 at the Jesuit college in Quebec. ASJCF, 748; Varia, V, 6. ASQ, mss, 374. Beatificationis et canonizationis servae Dei Catharinae Tekawitha virginis indianae positio super virtutibus (Rome, 1940). Claude Dablon, Relation de ce qui s’est passé de plus remarquable aux missions des peres de la Compagnie de Jésus en la Nouvelle-France, les années 1673 à 1679 (New York, 1860). JR (Thwaites). Lettres édifiantes et curieuses escrites des missions étrangères par quelques missionnaires de la Compagnie de Jésus (30v., Paris, 1707–73), XII, XIII. E. J. Devine, Historic Caughnawaga (Montreal, 1922). A. E. Jones, « ȣendake Ehen » or old Huronia (Toronto, 1909). Rochemonteix, Les Jésuites et la N.-F. au XVIIe siècle, III, 597–612. Henri Béchard, “CHOLENEC, PIERRE,” in Dictionary of Canadian Biography, vol. 2, University of Toronto/Université Laval, 2003–, accessed April 26, 2019, http://www.biographi.ca/en/bio/cholenec_pierre_2E.html.